Wasps held off Leicester's late surge to book their place in the Powergen Cup final against Llanelli Scarlets. The Tigers out-scored Wasps by three tries to one but were undone by the right boot of Wasps fly-half Jeremy Staunton, who kicked 17 points. Wasps were always in front and sealed the win when Ayoola Erinle burst through with seven minutes to go. Leicester scored a late try through Dan Hipkiss to add to earlier scores from wingers Tom Varndell and Leon Lloyd. The game began with a late change to the published line-ups, with Wasps full-back Mark van Gisbergen forced out with a back injury. His absence saw Staunton take over the kicking duties and meant Erinle was promoted from the bench to the starting line-up. Staunton's three penalties were the only scores of a scrappy opening half-hour. But on 33 minutes Leicester bagged the game's first try. 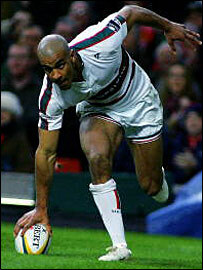 Lloyd outjumped Josh Lewsey to flick Austin Healey's clever kick forward into the path of Varndell, who touched down behind the posts. Six minutes after the restart, the lead was cut to two points as Healey once again proved Leicester's catalyst, setting up a move which saw Lloyd touch down in the corner. Staunton added another penalty to stretch Wasps' lead to five points, but Leicester turned up the heat in a bid to get back on terms. However, their commitment to attack left them vulnerable to a counter. And when Andy Goode's pass rebounded off the chest of Sam Vesty, Erinle pounced, sprinting two-thirds of the length of the pitch to score a converted try. With three minutes left, the Tigers were denied a try when referee Nigel Owens was happy the ball had been grounded, but the replay official said it could not be given as three hands were on the ball. They did eventually cross the line through Dan Hipkiss, but the game was already lost. Wasps will play Llanelli Scarlets in the final at Twickenham on 9 April. 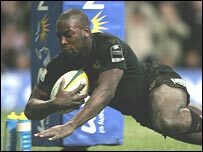 "It is important that when you are playing well and not scoring tries you need penalties to keep the scoreboard moving. "Those penalties gave us the points our rugby in the first half deserved. Without them it could well have been a different story. "In the second half we had to dig in because Leicester were doing well and it takes a lot out of you. "I can only quote Rafael Ibanez who said: 'Now I can understand what it is to be Wasp.' And I concur. It's a great feeling." "The 12-5 half-time score was a fair reflection but in the second half we came out and played well. "Not much separated us, we scored the tries but it wasn't enough. "Andy was poorly coming into game. He will be disappointed (at missing two penalties and a conversion) but we certainly don't blame him." Wasps: Erinle; Lewsey, Waters, Abbott, Voyce; Staunton, Reddan; McKenzie, Ibanez, Payne; Shaw, R Birkett; Worsley, O'Connor, Dallaglio. Replacements: Barratt, M. Dawson, Skivington, Haskell, J. Dawson, Brooks. Leicester: Vesty; Murphy, Hipkiss, Lloyd, Varndell; Goode, Healey; Rowntree, Chuter, White; L Deacon, Kay; Moody, H Tuilagi, Corry. Replacements: Buckland, Holford, Cullen, Ellis, Cornwell, A. Tuilagi, Jennings.